MERCURY reached its Superior Conjunction with the Sun on June 28,and will re-emerge as an Evening Star in mid July, about thirty minutes after sunset. Southern observers are favoured this month, but to find Mercury you will also need an unobstructed horizon, and perhaps a pair of good binoculars. Due to his low altitude and constant closeness to the horizon Mercury appears yellow reddish in colour, as the Sun when on the horizon. Mercury also tends to blink more than other planets, so that he can be easily taken for a star. 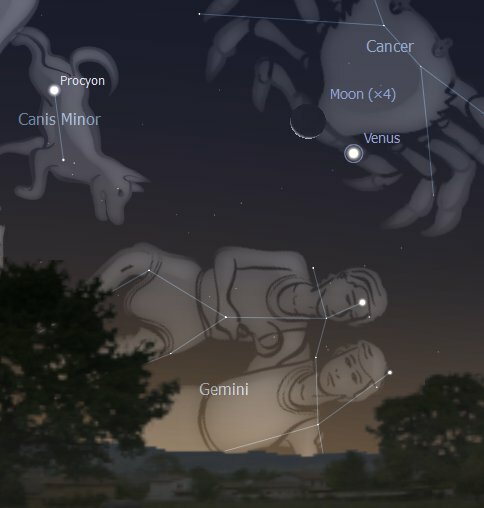 Between July 12 and 14 the waxing Crescent Moon and Venus will appear close to Mercury in the evening sky, toward North-West, an opportunity to spot this elusive planet in the twilight of the day. 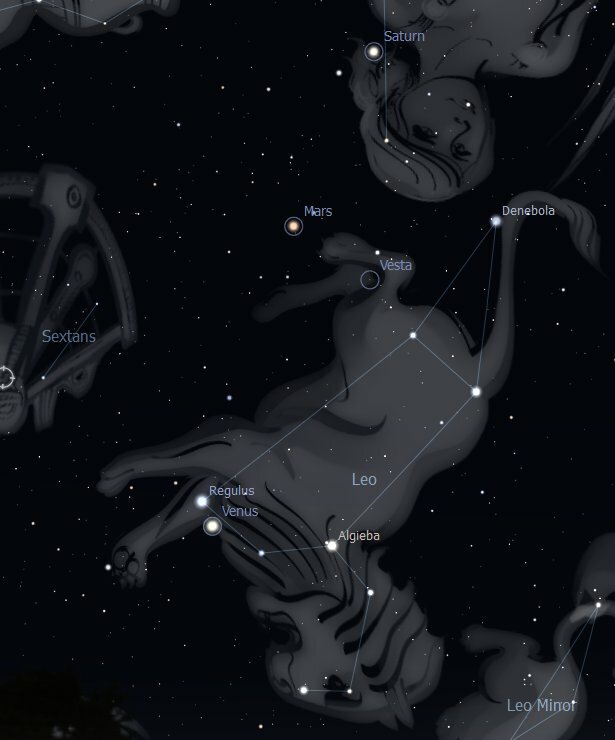 On July 26 and 27 Mercury will be seen very close to Regulus, the alpha star of Leo constellation (find snapshots in the July Calendar of Observable Events, below). Mercury will reach its maximum elongation (time of greatest visibility) on August 7, 2010. Our Sister Planet will remain the beautiful Evening Star until October 2010. In July VENUS will set after 8 pm, three hours after the winter Sun (in Southern Latitudes). With a magnitude of -4.1, Venus is still the brightest planet, easily observed looking toward the west in the evening. Finding Venus can also help us to spot other members of our solar family, as well as constellations and stars. 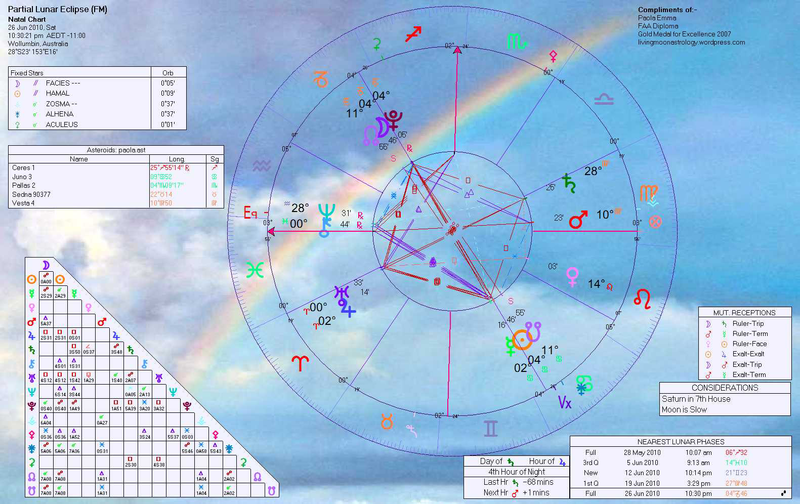 The Evening Star’s incarnation of Venus represents a collective opportunity to become more self-reflective, acknowledging our contribution to any relationship issues we may be experiencing. The Goddess of Love is looking deeper into our hearts and show us the way to a less self-centred and more aware kind of loving. MARS‘ light still diminishes this month, from magnitude +1.4 to + 1.5. You can spot Mars in the evening in the North-West, relatively low above the horizon, reddish in colour, rising in daylight and setting around 9, 9.30 pm, depending on your view. 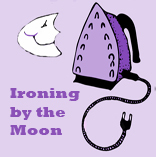 It will be easily spotted on July 16 when it will be close to the waxing Moon (find snapshots in the July Calendar of Observable Events, below). JUPITER, after emerging from the glare of the Sun in March, is now a very bright star in the East (magnitude – 2.6), rising just before midnight at the start of July and around 10 pm at the end of the month. Jupiter will become brighter and brighter as the year advances, reaching its greatest brilliance in its whole 11.8 years cycle just in time for the Libra Equinox 2010 (September 21). This is due to the fact the giant planet will reach its perihelion, closest position in relation to the Sun, in March 2011. There is a companion to Jupiter in the pre-dawn sky, though invisible, so you will need a good pair of binoculars to spot it, 0.4 degrees above Jupiter. It is giant Uranus, spinning at right angle to everyone else, a bluish/green star-like object. Jupiter is -2.6 magnitude and Uranus at +5.8, dim but still the brightest object in the vicinity of Jupiter. Rising in the East around 11 am Saturn will set around 11 pm at the beginning of July, while, at the end of the month, it will rise around 9 am and set around 9 pm. 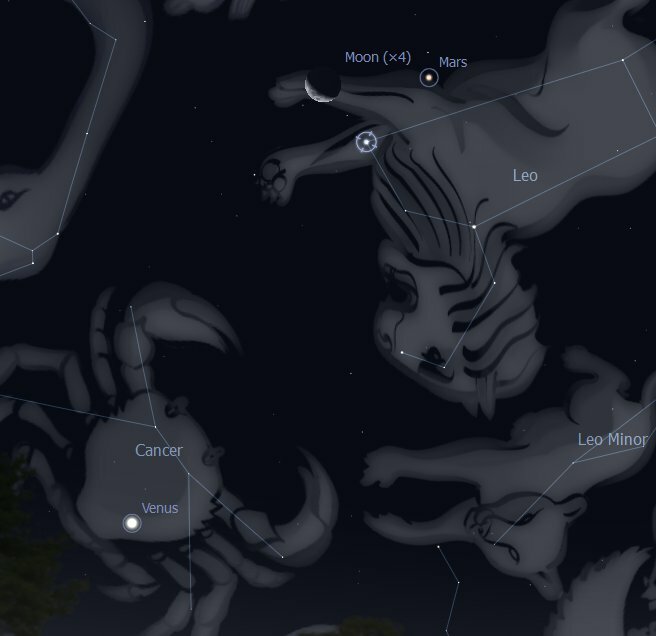 The ringed planet is now transiting between the Constellations of Leo and Virgo. It will shine at + 1.1 magnitude during the month. Like Mars, Saturn also is becoming dimmer this month, around +1 magnitude, moving away from the Earth at an angle that will cause its rings to become thinner, reflecting less sunlight. 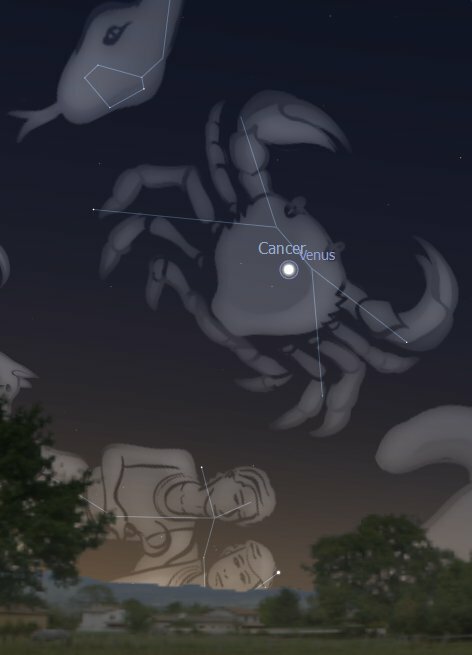 Mars will be conjunct Saturn on July 31 and in early August Venus will also join them in the evening sky (find snapshots in the July Calendar of Observable Events, below). 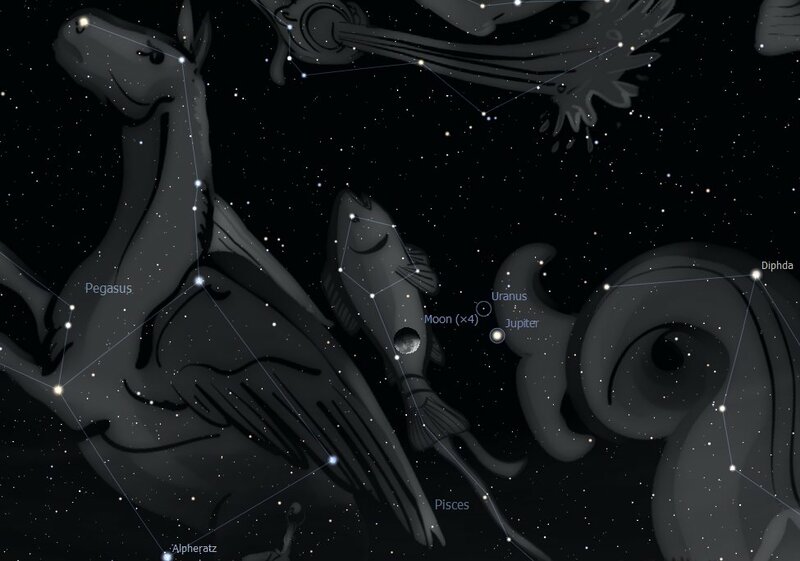 JULY 4-5: the Moon can be observed very close to Jupiter (and invisible Uranus) between the Constellations of Cetus (the Whale), Pegasus (the Winged Horse) and the Southern Fish of Pisces. The snapshot was taken on July 4, looking toward the East, around 1.30 am. The couple will remain visible well into daylight. 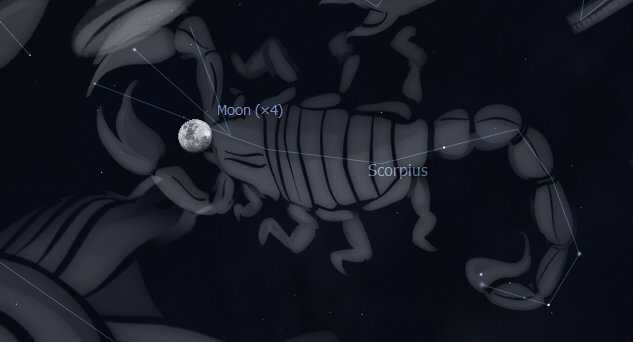 On JULY 5 the Moon will still be fairly close to Jupiter and her distance from him will tell you something about her daily motion and West-East direction. 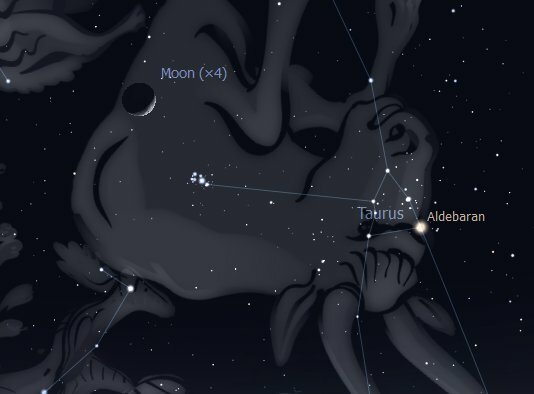 JULY 8: The Waning Balsamic Moon (around 45 degrees behind the Sun) can be observed close to the Pleiades, or Seven Sisters. 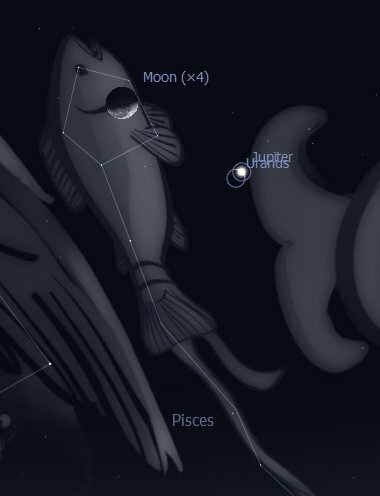 The Moon’s brightness may absorb the light of the fainter stars in the cluster, but the brightest should remain visible and clear, especially through binoculars. At this phase the Moon will hopefully show the so-called Earthshine, a phantom image of the past or future (?) Full Moon. This sky scape was taken early in the morning, around 5.30, looking toward the North-East. 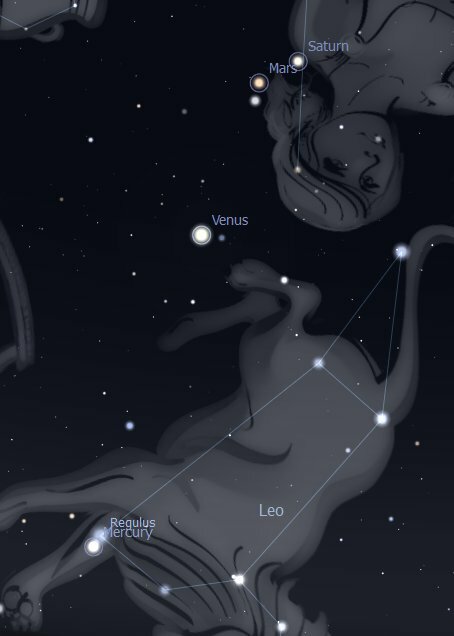 JULY 10/11: these nights we can observe bright Venus conjunct the alpha star of Leo Constellation, Regulus. The sky scape below was taken on July 9, around 6.30 pm, looking toward the North-West. 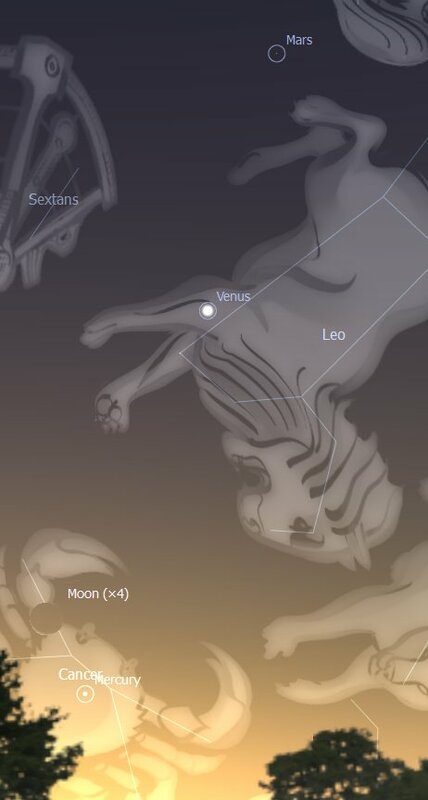 JULY 13: the tiny Crescent Moon is conjunct Mercury in the dusk twilight, and in line with them, looking up, are Venus, and appearing as it gets darker, also Mars and Saturn. The snapshot of this event was taken looking North-West, around 5.30 pm. 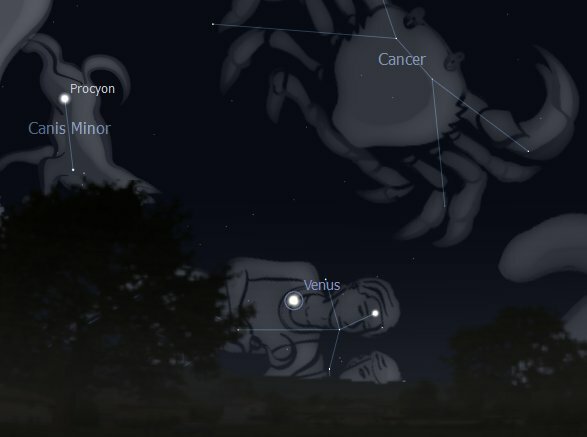 JULY 15: the waxing Crescent Moon can be observed close to Venus and moving toward Mars, Saturn and Spica, around 6.30 pm, looking toward the North-West. 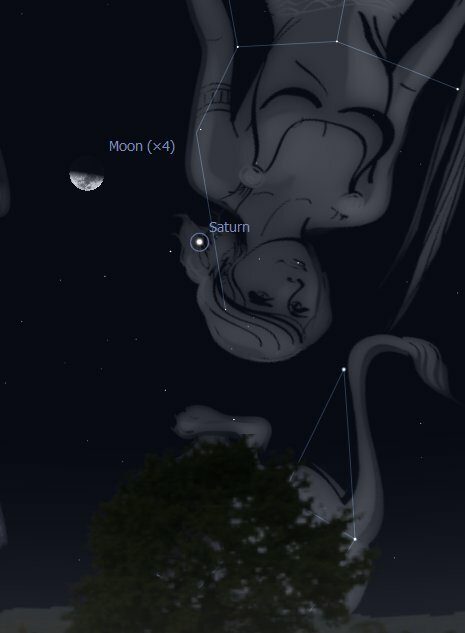 JULY 16: The waxing Moon will be visibly conjunct Mars and Saturn on July 16. The sky scape below was taken on the 16, around 6.30 pm, looking toward the North-West. 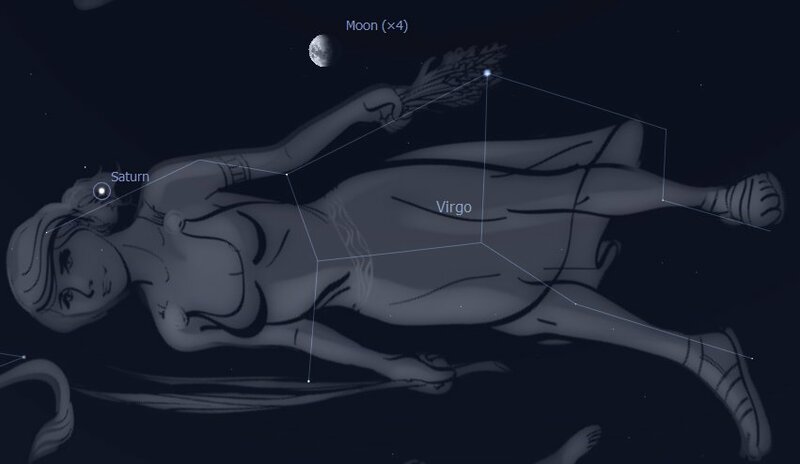 JULY 18: Tonight we can observe the First Quarter Moon conjunct Spica, the alpha star of Constellation Virgo. This snapshot was taken at around 6.30 pm, looking toward the North-West. 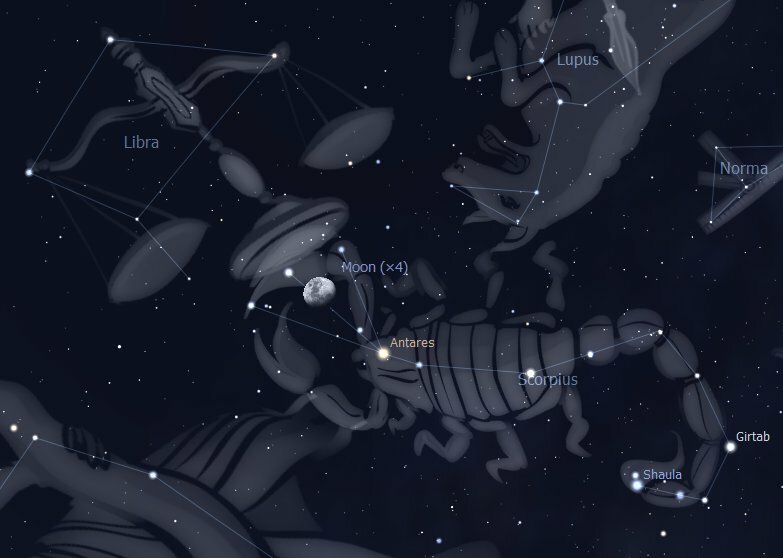 JULY 21: the waxing Moon can be seen very close to Antares, the brilliant alpha star of Scorpio Constellation. The conjunction will become visible as the sky darkens. The snapshot below was taken around 6 pm, looking toward the east. JULY 27: Mercury, very low on the western horizon, is perfectly conjunct the alpha star of constellation Leo, Regulus. 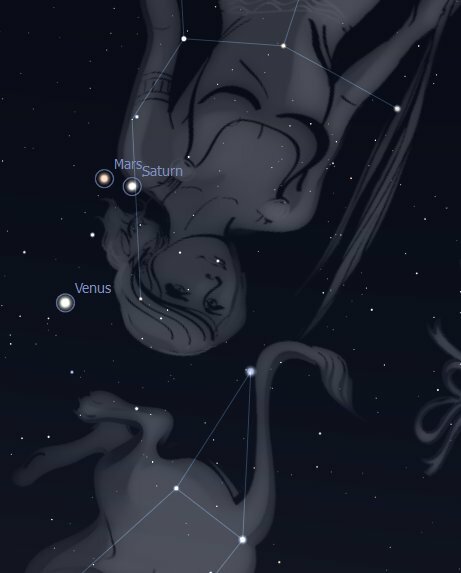 Above, much brighter than Mercury, Venus, Mars and Saturn are getting closer to each other (they will be at their closest, as a group, on August 7). This snapshot was taken at about 6.30 pm, looking West, with a very low horizon, like that of a boat in the middle of the ocean. 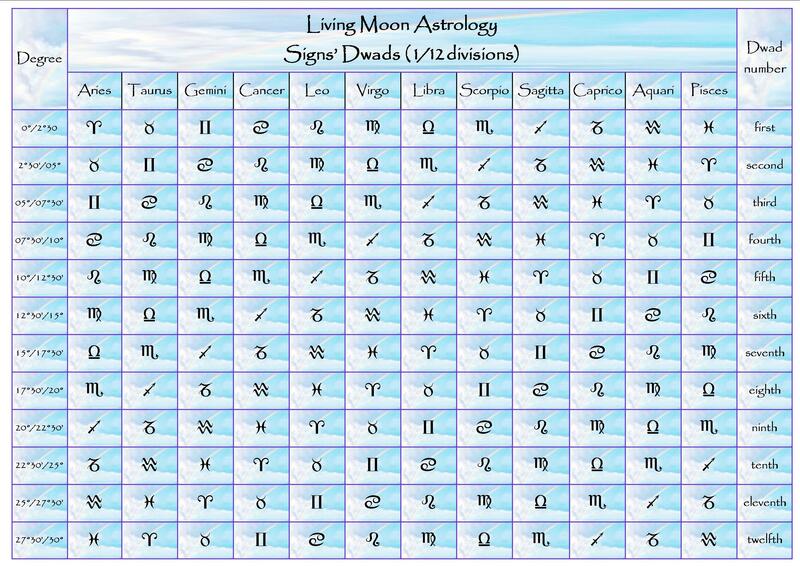 JULY 31: Soon after entering the tropical Sign of Libra Mars will conjunct Saturn. 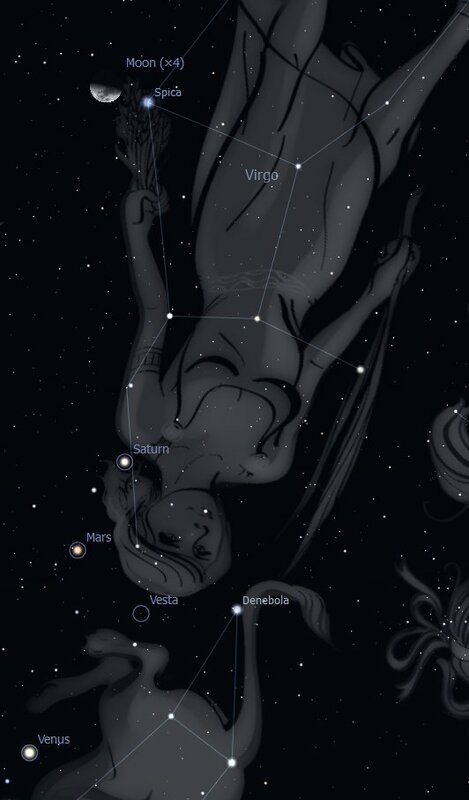 Venus is close by, due to become conjunct Saturn on August 9 and Mars on August 21. 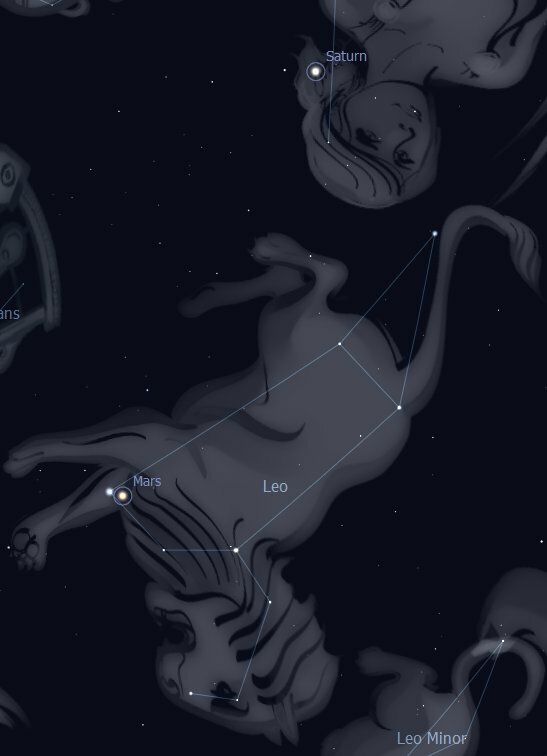 The three can be seen against the backdrop of Virgo Constellation. This snapshot was taken at around 6.15 pm, looking toward the North-West. 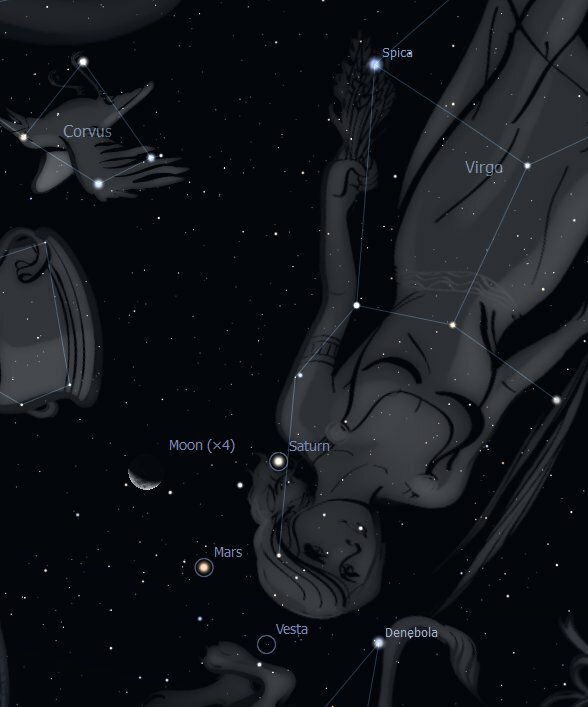 For more snapshots of observable astronomical events in 2010, please CLICK HERE. By the end of June Saturn will rise around midday and set around midnight. Saturn emanates a yellowish light, easily spotted between Regulus of constellation Leo and Spica of constellation Virgo, not far from Mars. Like Mars, Saturn also is becoming dimmer this month, around +1 magnitude, moving away from the Earth at an angle that will cause its rings to become thinner, reflecting less sunlight. It’s really amazing. The picture truly represents the formation of the stars and its coordination with the planets and the whole constellation itself. It’s really interesting though at first glance it’s hard to understand the theory but I got it now. This is a good post indeed. 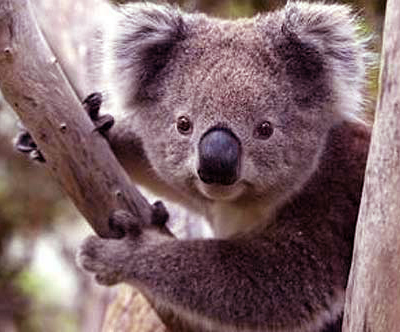 I found it fascinating.